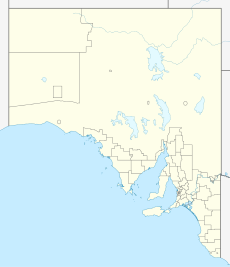 Port Broughton is a small South Australian town located at the northern extent of the Yorke Peninsula on the east coast of Spencer Gulf. It is situated about 170 km north-west of Adelaide, and 56 km south of Port Pirie. At the 2011 census, the town of Port Broughton had a population of 1,034. The close proximity to Adelaide (two hours' drive) makes it a popular tourist destination, with the number of people in town swelling to over 4000 in the summer holidays. The land around Port Broughton was initially used for grazing, however the local conditions were unsuitable and the land was divided up into acre lots and sold. Port Broughton was surveyed in 1871 to service the surrounding wheat and barley growers on the recommendation of Captain Henry Dale. It is on a sheltered inlet called Mundoora Arm Inlet at the extreme northern end of Yorke Peninsula. The town is named after the Broughton River (named by Edward John Eyre after William Broughton), the mouth of which is about 40 kilometres (25 mi) north of the township. Built in 1876, the 'T'-shaped jetty was serviced by an isolated 3 ft 6 in (1,067 mm) narrow gauge railway line from Mundoora, 16 km inland and uphill. The Port Broughton railway line, officially opened on 11 March 1876, brought the grain down to the port. Horses were used to tow the empty wagons uphill, but they were sent downhill powered only by gravity, with a driver to operate the brakes. The passenger service ceased on 17 September 1925, but the grain traffic continued. During January, 1926, a Fordson rail tractor displaced the animal power. From 1931, the railways contracted out the service to a private operator. The service ceased altogether on 3 August 1942, but the tractor continued to shunt wheat wagons between the station yard and the jetty until moved elsewhere. Ketches carried the grain from the jetty 8 kilometres out into the gulf where the larger windjammers were anchored to carry the grain back to England. The windjammers ceased to call in 1949. Locomotives were proposed in 1906. In June 1943, Edward Gage, an electrical fitter who worked for BHP in Whyalla, was killed after his Tiger Moth plane ran out of fuel and crash landed in Spencer Gulf. He was last seen flying over Port Broughton, enroute to Whyalla from Parafield. A coronial inquiry followed but neither his remains nor that of the plane were found. In January 1990, Goolwa man Ron Anchor arranged a search party to find the wreck. Lying on the eastern side of Spencer Gulf, Port Broughton's coastline is relatively protected, resulting in large expanses of shallow water and seagrasses, tidal flats and vast areas of mangroves that flank the inlet on which the town is built. The small town of Fisherman Bay lies 5 km north of Port Broughton and has much the same coastal features. Between the mouth of Fisherman Bay and Port Broughton lies Shag Island, an important breeding site for several species of cormorant. The Broughton River lies further north toward Port Pirie, where its estuary is located. Further inland, most of the land is fairly featureless farming country, with only fragments of the original vegetation remaining. Port Broughton was briefly home to a short lived newspaper published by William John George and James Sisely. Originally called Port Broughton Echo (1887), it was printed by the Northern Argus in Clare. It was then renamed to Broughton Echo (1887-1888), but soon ceased publication in July 1888. Since its establishment, Port Broughton's economy has largely been driven agriculture, in particular cereal crops. Commercial fishing is also an important part of the economy, with scalefish and Blue Swimmer Crabs accounting for much of the catch. As of 2010[update] Port Broughton supports a prawning fleet. Like many towns on the Yorke Peninsula, Port Broughton is a prime tourist destination, with activities such as fishing, crabbing and a variety of watersports being popular. The town has a boat ramp for such activities. The town has two caravan parks and a number of units, as well as a motel. Nearby Fisherman's Bay has many shacks belonging to holiday-makers, as well as its own small boat ramp. The recorded population the township of Port Broughton at the time of the 2011 census was 982 (Port Broughton district population 1424). The majority of the population (838) were Australian born, with the majority of immigrants coming from the United Kingdom. The census also found that over half the population of Port Broughton is over 55, with the median age being 61, suggesting the town is popular with retirees. Christianity is the dominant religion in the region, and is well serviced by a number of churches. The town has a number of sporting clubs including Cricket and Netball clubs, and an Australian rules football club playing in the Northern Areas Football Association as the Broughton-Mundoora Eagles. Port Broughton is the seat of the District Council of Barunga West. The mayor currently is Cynthia Axford. It is in the state electoral district of Narungga and the federal Division of Grey. ^ a b Australian Bureau of Statistics (27 June 2017). "Port Broughton (L) (Urban Centre/Locality)". 2016 Census QuickStats. Retrieved 20 April 2014. ^ "Search result for "Port Broughton (Locality Bounded)" (Record no SASA0040532) with the following layers selected – "Suburbs and Localities" and "Place names (gazetteer)"". Government of South Australia, Department of Planning, Transport and Infrastructure. Retrieved 6 May 2016. ^ Callaghan, W.H. (August 2003). "The Rise and Fall of the Port Broughton Line". Australian Railway Historical Society Bulletin: 283–289. ^ "THE SOUTH AUSTRALIAN PARLIAMENT". The Advertiser. Adelaide. 25 July 1906. p. 3. Retrieved 5 October 2014 – via National Library of Australia. ^ "S.A. PLANE LOST IN GULF". News (Adelaide, SA : 1923 - 1954). 7 June 1943. p. 1. Retrieved 16 April 2018. ^ "PILOT AND PLANE LOST". Whyalla News (SA : 1940 - 1954). 17 September 1943. p. 2. Retrieved 16 April 2018. ^ "Goolwa man seeks missing plane". Times (Victor Harbor, SA : 1987 - 1999). 19 January 1990. p. 3. Retrieved 16 April 2018. ^ a b "The Broughton echo". State Library of South Australia. Retrieved 23 August 2018. ^ Laube, Anthony. "LibGuides: SA Newspapers: A-B". guides.slsa.sa.gov.au. Retrieved 23 August 2018. ^ "History". Port Broughton South Australia. Retrieved 28 August 2018. ^ "Your guide to getting around Yorke Peninsula and planning your next South Australian holiday. – Yorke Peninsula". Yorke Peninsula Tourism. p. Port Broughton. Retrieved 9 January 2016. Wikimedia Commons has media related to Port Broughton.